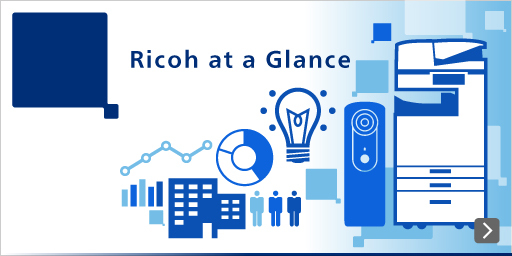 The five materialities that the Ricoh Group set in April 2017 include items for achieving a zero-carbon society and circular economy. We accordingly set about reinforcing our efforts by formulating the Ricoh Group Environmental Declaration and environmental goals. We particularly seek to achieve a zero-carbon society, tackling global warming by eliminating greenhouse gas (GHG) emissions across the entire value chain by 2050. We will reach that goal by conserving energy and using renewable energy. We were the first Japanese company to join RE100, an international initiative striving to increase the demand for and delivery of renewable energy. While striving to enhance the energy efficiency of our products, we will collaborate with business partners and customers to help decarbonize society throughout the value chain. Companies collaborating in this global initiative seek to source 100% renewable electricity. ・GHG Scope 1: All direct GHG emissions from our manufacturing plants, offices, vehicles etc. We are leveraging strategies to develop technologies that help decarbonize economies, run energy efficiency and renewables businesses that relate to conserving and reusing energy, and decarbonating our operating sites, thereby contributing to corporate and social progress. To generate necessary energy for local consumption, technologies that harvest solar and other light, vibration, heat, and other untapped energy sources and convert it into electricity are spotlighted. 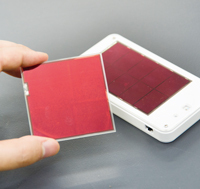 Advanced dye-sensitized solar cells can generate electricity efficiently even under LED or other weak lighting conditions indoors. We have applied organic photoreceptor and supercritical fluid technologies that we amassed in developing multifunction and other products to ensure safety by using only solid electrolyte structures offering more than double the electrical output of amorphous silicon solar cells. Ricoh’s MFPs incorporate proprietary offerings that enable quick recoveries from Energy Saver Mode, including Quick Start Up technology and low-melting-point toner. Color MFPs* that we launched in May 2016 employ a human detection sensor that wakes the system from energy saver mode in just 0.5 second to enable key operations. We are helping to lower carbon dioxide emissions around the world by providing decarbonization solutions. In the social infrastructure arena, we maintain power sales services and offer customers solutions to enhance energy efficiency by enabling them to visualize their electricity consumption. We are helping to popularize electric vehicles by selling, constructing, operating, and maintaining charger facilities. Our solar power operations and maintenance service stabilizes the running of such facilities and supports business planning and operations in that area so customers can tap renewable energy more consistently and efficiently. We deployed a local energy production and consumption model bathhouse and other facilities that tap heat from biomass boilers fueled by woodchips from thinned timber. 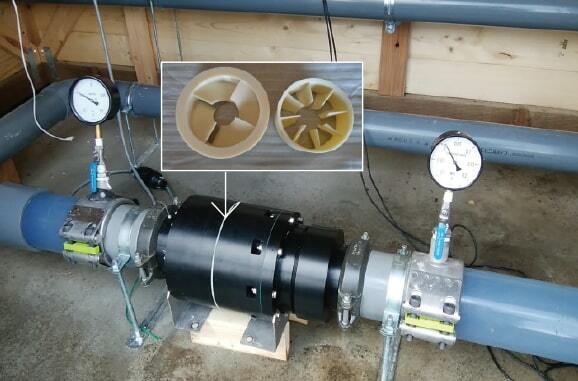 We are conducting verification tests with several municipalities and companies with a micro hydropower system that harnesses water flows from streams, irrigation canals, and building air conditioning. We are enhancing the operational rates of water turbines by employing proprietary technology to hollow their structures. We have rolled out business initiatives to enhance energy efficiency by improving production processes and managing office energy consumption. Our thorough energy conservation activities include installing energy-efficient equipment. In the year ended March 31, 2018, we undertook more than 300 measures that cut our carbon dioxide emissions by around 7,000 metric tons. We deployed energy conservation efforts in-house and with customers as part of worldwide efforts to lower environmental impact. We were the first Japanese company to join to RE100. We have formulated a roadmap to reach RE100 targets and use renewable energy globally. Our U.S. sales subsidiary and Numazu plant installed solar power systems. Our Asian sales headquarters in Singapore already sources 25% of its electricity from renewables, and looks to lift that rate to 100% by the year ending March 31, 2020. At more than 60 sites in 12 countries, European sales companies had sourced all of their electricity from renewables by the end of the year under review. 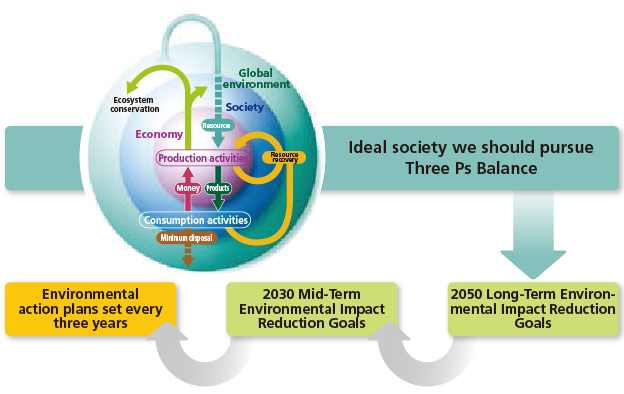 Recycling and reduction are key concepts for reaching this goal. We are accordingly constraining the use of new resources in our offerings, recycling products, and using recycled resources to enhance resource efficiency in our operations. We pursue designs that consume fewer new resources. 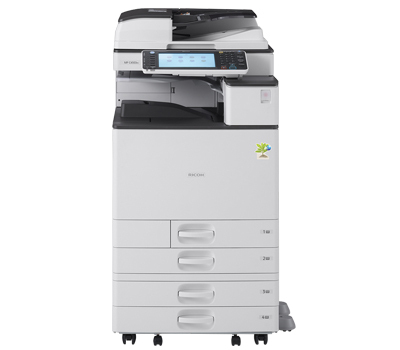 For example, the RICOH MPC 6004 color laser MFP occupies 37% less space and is more than 64% lighter than conventional models. This is because we reduced the frame weight and developed a compact and lightweight motor and created thinner plastic parts and metal sheets. We reuse MFPs from around the world for reconditioned machines*1 and parts. In Japan, we maintain an efficient, wide-ranging collection setup. It includes a system that predicts MFP collection times and quantities and a stock management system that shows the conditions and quantities of collected products. The RICOH Eco Business Center installed a recovered machine storage management system that uses internally developed color coding. 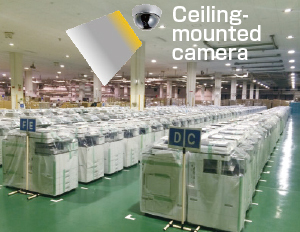 The facility manages stock levels and location information by using a ceiling-mounted camera to scan recovered machine color codes. This setup selects machines that are suitable for reconditioning and uses proprietary automated guided vehicles to take machines to production lines. This offers quality equivalent to that of new models while employing an average 77% of parts from recovered products. We take a closed recycling approach, incorporating recycled parts and materials from our products in our offerings. To create top-quality recycled plastics from recovered equipment, we reviewed collection systems and collaborated with materials manufacturers in developing technologies to restore the quality of collected materials. We thereby lifted the content of recovered materials from 10% to 50% of conventional materials in recycled plastic. We are augmenting closed recycling by using commercially marketed recycled materials that match the inflammability and strength requirements of our MFPs. We began taking this approach with materials for equipment interiors. Through a development effort with Teijin Limited, we have extended open recycling to high-grade plastic products for external use. Our award-winning new returnable eco packaging for copier products features an improved shape for stacking and is light and can be used repeatedly, offering greater recycling efficiency and durability than conventional designs. By using less material, this packaging has significantly lowered carbon dioxide emissions and environmental impact. We extensively reduce emissions and resource losses and properly use water worldwide. Our efforts focus on areas associated with the greatest such discharges, notably polymerized toner production, thermal media operations, and production packaging materials for shipments between domestic and overseas business sites. In the year under review, we lowered waste discharges as a percentage of sales by 3.8% from a year earlier on the strength of improved toner manufacturing processes. We tackle water issues, which are a growing focus around the globe, by assessing water risks at each business site and using water effectively in view of local and business conditions. We currently use this packaging in Japan to take advantage of our collection systems framework and cost structure. We launched this initiative in April 2017 to enhance business growth and corporate value while reinforcing collaboration with society and other stakeholders by establishing priority strategies and targets. One key endeavor is to prevent global warming through companywide projects that seek to eliminate greenhouse gas emissions from our operations by extensively conserving energy and using renewables. Under the plan, we will foster environmental management that contributes to sustainable development for society and the Ricoh Group. ・Exceeded the yearly target considerably, due to expanded sales of color MFPs equipped with superior energy-saving features. Will continue working to expand sales of products with superior energy-saving features. ・Reduced the amount of CO2 emissions (scope 1, 2) by 2.9% from FY2017/03 to 472,000 tons in FY2018/03, thereby achieving the target. ・Increased the resource conservation rate for products to 22.0% for FY2018/03, an improvement from 21.9% for FY2017/03, thereby achieving the target. Will continue working to improve the rate. ・Reduced the amount of waste proportionate to sales by 3.8% from FY2017/03, thereby achieving the target. Will continue working to reduce cost and waste of resources alike. ・Reduced water usage proportionate to sales by 6.1% from FY2017/03, thereby achieving the target. Will continue working to reduce water usage. ・Reduced usage of environmentally sensitive substances to below the FY2017/03 level, thereby achieving the target. ・Reduced emissions of environmentally sensitive substances to below the FY2017/03 level, thereby achieving the target. ・Will continue working to reduce usage and emissions. a) Organized forestation activities in the Yanbaru forest in Okinawa in cooperation with local communities and customers. b) Selected two sites: Sakai City (Fukui Prefecture) and Nirasaki City (Yamanashi Prefecture). Held a kick-off meeting in Sakai City. c) Developed and carried out human capital development programs to promote biodiversity conservation activities in cooperation with stakeholders. d) Launched a new nature experience program for senior high school students. Continued the biology program for elementary school students as planned. e) Presented the number of participating stakeholders and promoted activities. 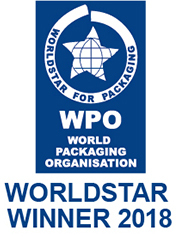 f) Confirmed that sustainable procurement policies are being complied with regarding Ricoh’s wood-based products, such as copy paper and packaging paper. Will continue working to ensure compliance with Ricoh’s wood-based products procurement policy. ・As of the end of March 2018, 81.4% of products (imaging products currently marketed in and outside of Japan) are certified with RSPP Product Rank, thereby achieving the target for FY2018/03. 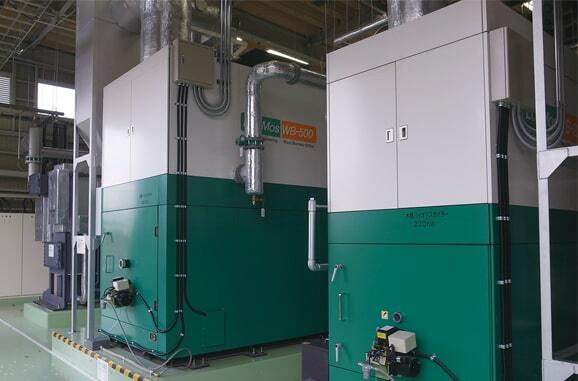 ・Following introduction in Europe, introduced SOP in Asia, Oceania and Canada, to expand proposal activities to reduce TCO and environmental impact at customers’ sites. Started preparations for introducing SOP in the United States, Latin America and Japan in FY2017/03, and will start sales force training for this purpose in FY2018/03. ・Launched a feasibility experiment project for oil reclamation using collected PET bottle caps at RICOH Eco Business Development Center. ・Signed a comprehensive cooperation agreement with the Gotemba City government primarily for advanced technology development. Started initiative to heat local spa facilities with wood biomass boilers. ・Made a presentation to introduce Ricoh’s activities in a side event co-hosted by RE100 and CDP at COP23. ・Participated in a dialogue session with the Minister of Foreign Affairs, Minister of the Environment and European Commission’s climate action department through J-CLP. ・Participated in a subcommittee for the Ministry of the Environment’s Long-term Low-carbon Vision and the Ministry of Foreign Affairs’ climate change expert meetings to present industrial recommendations. ・Announced participation in Yokohama City’s Smart Zone Alliance. ・Organized the Global Eco Action in June 2017, holding a related symposium and a presentation of employee environmental declaration. Launched the Eco Action Award. ・The total number of suppliers that have vigorously worked to reduce CO2 emissions in FY2018/03 reached five (target achieved). The combined amount of CO2 reduced by the five companies totaled 354 tons.